VANCOUVER, British Columbia — Indigenous leaders are calling on people to raise their voices Saturday to stop a $5.7 billion pipeline ($7.4 billion Canadian) expansion project that pumps oil from Canada's tar sands to the Pacific Coast. The Trans Mountain pipeline expansion by the Canadian division of Texas-based Kinder Morgan would nearly triple the flow of oil from Alberta's tar sands to the Vancouver area and dramatically increase the number of oil tankers traveling the shared waters between Canada and Washington state. Texas-based Kinder Morgan says it is moving ahead with preparatory work at two terminals in in the Vancouver suburb of Burnaby but still needs to obtain numerous local permits and federal condition approvals to begin construction. Thousands of opponents are expected to march in Burnaby Saturday — the latest demonstrations in the dispute over a project that Prime Minister Justin Trudeau said was in Canada's best interest when he approved it in late 2016. The project has drawn legal challenges and opposition from environmental groups and Native American tribes as well as from municipalities such as Vancouver and Burnaby. It's also sparked a dispute between the provinces of Alberta, which has the world's third largest oil reserves, and British Columbia. Opponents say increasing the flow of oil sent by pipeline and boosting the number of ships to transport it would increase the risks of oil spills and potential impacts to fish, orcas and other wildlife. They also say more fossil fuel development is not needed. "We cannot sit by idly and let this project go with the way it would threaten our livelihood, our lives, our territories, our waters and our culture," said Dustin Rivers, a Squamish Nation leader. Amy George, an elder with the Tsleil-Waututh Nation, called on people to "come with your drums and a make a lot of noise and show that we really mean it." The Tsleil-Waututh Nation is one of several Native American tribes, called First Nations in Canada, that have legally challenged federal approval of the project, saying consultation with First Nations was not adequate. "We never surrendered, ceded or released the land," said Manuel, who is leading a group of activists building tiny homes that will be erected along the pipeline's route in an attempt to assert indigenous sovereignty. She and tribal leaders from the U.S. and across Canada spoke to reporters in Vancouver on Friday — on the same day a British Columbia judge granted Trans Mountain an interim injunction aimed at preventing anti-pipeline activists from coming within 50 meters of two terminals in Burnaby. Karen Mahon, the campaign director of the Stand.Earth environmental group helping to organize Saturday's march, called it "an intimidation tactic." 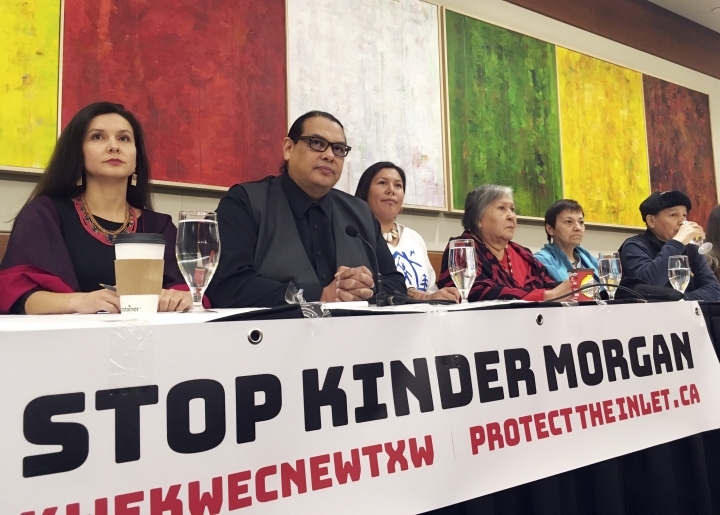 Kinder Morgan says it remains committed to environmental protection and world leading spill response and that it has "support from First Nations communities whose reserves it intends to cross." Tribal leaders on Friday disputed that. Trudeau has defended the project. In a talk with Bill Nye, "the science guy," in Ottawa Tuesday, Trudeau said the pipeline expansion is part of a larger national plan to meet emissions targets in Paris Climate Accord that includes a cap on tar sands emissions. Canada's tar sands are located almost exclusively in northern Alberta and contain an estimated 167 billion barrels of oil, according to the province. Tar sands, also referred to as oil sands, are a mixture of water, clay, sand and bitumen, a heavy viscous oil. Trudeau said Alberta needs to export its oil outside of the U.S. to get better prices and that "a modern pipeline can be very carefully monitored and can be done safely." Kinder Morgan has said the expanded pipeline capacity — from 300,000 to 890,000 barrels of oil per day — would allow oil companies to access growing markets in Asia and U.S. states, including Washington state and California. It is scheduled to be completed by December 2020. The project would carry oil from near Edmonton, Alberta, to a terminal in Burnaby, British Columbia. From there, vessels would generally travel through Haro Strait near Washington state's San Juan Island and on to the Pacific Ocean. Three new berths at the Westridge Marine Terminal in Burnaby would accommodate increase tanker traffic — from five to 35 vessels monthly. Canada's National Energy Board last month issued decisions allowing the project to start construction work on the tunnel entrance at Burnaby Mountain. The project started work this month. The board also said about 56 percent of the entire route has been approved and construction is not yet authorized along the rest of the 713-mile (1,150-kilometer) pipeline route. The board recommended the project's approval in 2016, with 157 conditions. It said the project was in the public's interest, but noted it would increase greenhouse gas emissions and that project-related marine vessels would have "significant adverse effects" on endangered southern resident killer whales, the orcas that spend time in the inland waters of Washington state. "We're deeply concerned about the impacts that a spill is going to have. It's not a question of if, it's when," said Jay Julius, chairman of the Lummi Nation, one of several U.S. tribes that had testified before Canada regulators opposing the project.